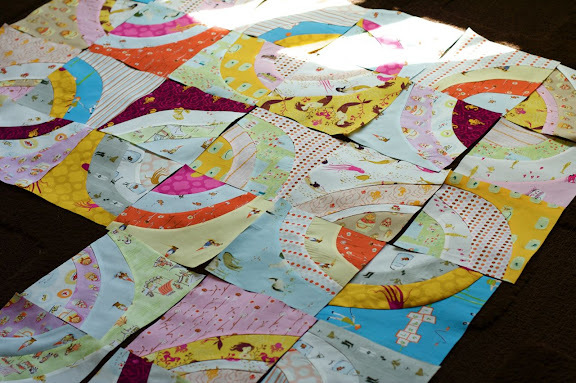 i think i'm getting my quilting drive back, all i want to do is work on this scrappy circles quilt. I laid it all out and asked my 4 year old daughter what she thought of it, and her response was, 'it's not very pretty.' lol--she's my toughest critic. update: I purchased the scrappy circles pattern here. This is gorgeous! Its so bright and happy! I love that quilt. Is it had to do circles??? I would love to try one. It was so funny to see this post today! I was just thinking last night of doing this quilt, only I wanted to have one fabric for one circle and the rest of it be a solid white. Great minds think alike! someone's been hording their heather ross fabrics - looks awesome! Very Fun!! Great looking quilt. I must make this pattern. Thank you for mentioning where you got it! So fun! All my favorite fabrics! I guess I could see how someone who doesn't know designer fabrics could think this was too scrappy to be 'pretty' - maybe she would have liked just white and pink. But we all love it! It is so cute - and I love that you are using all Heather Ross fabrics - there are some oldies in there! What a fun use for them! YOu have a lovely collection of Heather Ross!Save a block or two for her unicorns and princess and the pea prints! I made that quilt and it was a lot of fun and went together really quickly. It looks great in those fabrics. Oh I love scrappy circles! Love it with all the amazing Heather Ross fabrics. Yours is cuter than the pattern. I bet it quilts up really sweet. Love this! Great colors, so fresh looking! I think it's ROCKtastic and I'm FOUR-ty three. Well I think its awesome...and I bet its super soft too. wow, love this. love all the Heather Ross fabrics in it. But a very good looking beast! I really like it! Great fabrics! Oh my! I love this. I've been thinking about doing an all HR fabrics quilt too! Love your choice of quilt pattern. 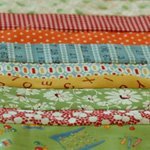 Looks like you are getting back into quilting with a bang! You win the gold star for today...that is hands down, just flat precious! Very very cute. Love all the Heather Ross together. That photo is super inviting! I do like your scrappy circle quilt. The colours are fantastic. So pretty. I just love it! I bet your daughter will too once it is done! I don't know what I love more about it, the circles or the Heather Ross. It's fantastic! It looks great! I love the pattern and the fabrics. it's gorgeous! i'm loving it!! I showed this to a granddaughter and she said it didn't match ...what do they know! I think the fabric colours are great. Emily has great patterns. This one works up so cute! my daughter has been my quilting adviser lately...she does all the laying out and saves me the headache. This circles quilt is really beautiful. Your quilts are pieces of art. I love them!!! I love this! very nice. I love your circles! How fun! Those circles are great! You are so brave! It's lovely. That is going to be one soft quilt with all that Heather Ross goodness! I love that quilt.Very special fabrics and color choice but very springlike. How difficult ar the curves? Tempted by yours. I may just have to try them. I love your colr choices. Thanks for the inspiration. The circles are wonderful! And I love the colors. You've given me a good idea of something to do with my scraps. I'll check out the pattern.